She left her whole world behind to find the one thing that really matters. Jane Mitchell has many dreams for her life, but living in the 17th century was never one of them. Unknowingly transported through time by the meddling witch Morna, Jane chooses to stay in the past so she can remain in her beloved nephew's life. Castle life doesn't really suit her, and Jane quickly finds that her love for her family isn't enough to fill her hungry soul. Eager for purpose, she takes work at the village inn. One frigid evening, she takes in the most infuriating man she's ever met - never suspecting for a moment that he could be the one her soul hungers for. Adwen MacChristy doesn't want to be laird of Cagair Castle. With a youth spent traveling the world and sleeping beneath the stars in the company of loose women, nothing weighs on Adwen's heart like knowing the life he loves is about to come to an end. He would rather spend his days as a penniless wanderer than take on the responsibilities handed to him by his father. On his last night of freedom, Adwen stops at the inn near McMillan Castle and meets the only lass to ever deny his advances, bewitching him in an instant. Suddenly, he finds himself believing that responsibility might not mean a life spent in chains if he has a fiery lass like Jane by his side. Will Jane allow herself to fall for a man who is the very embodiment of the reckless life she left behind, or will fate make the decision for her when it sends her through time once again? Excellent story of fantasy time travel. Lose yourself in the Scotland Highlands in the 17th century. A little humor, a little suspense, a lot of love and wonderful characters! Bethany has done it again with her 5th book in the Morna Series. Lily Collingwood NAILES the narration!! Don't miss this series! Can't get enough of this brilliant series!!!! What made the experience of listening to Love Beyond Compare the most enjoyable? I'm loving how well Lily Collingwood does the different voices she does such a good job its made it very enjoyable to listen to the audible versions of the books, as before listening to this series on audible I had never listened to one being narrated by someone else. I quite enjoyed the character of Adwen and how determined he is to stay single and not take on the responsiblity of being Laird of Cagair Castle, but then once he meets Jane it all changes but she wants nothing to do with him. I am thoroughly enjoying the audible version of this series and can't wait to get to the next in this brilliant series. I received a copy of this audiobook from the publisher in exchange for my fair and honest review.. It seems Morna is back to her old tricks again. This time, her unsuspecting victim is Jane, who by the way is quite skeptical about time travel. She meets Adwen and course sparks fly. I knew they were meant to be together,even if they rubbed each other the wrong way at first. Cooper of course, is always a scene stealer. Loved, loved this book! Where does Love Beyond Compare rank among all the audiobooks you’ve listened to so far? This book contains some sad and heartbreaking paths to get to the final Happily Ever after.. More than one event had me crying. But it was worth listening to just to get to the part when the 2 highlanders travel to the present and see all the things we take for granted. Would you listen to Love Beyond Compare again? Why? Yes! I love how Cooper thinks the fairies steal his socks and the unexpected romance between Jane and Adwen!!! She always brings the stories to life. I always enjoy each book!!! Keep writing Bethany and I will keep reading/listening!!! This is a great book; this is the fifth book in the Morna’s Legacy Series written by Bethany Claire and narrated by Lily Collingwood. Jane Mitchell has many dreams for her life, but living in the seventeenth century was never one of them. Unknowingly transported through time by the meddling witch, Morna, Jane chooses to stay in the past so she can remain in her beloved nephew’s life. Castle life doesn’t really suit her, and Jane quickly finds that her love for her family isn’t enough to fill her hungry soul. Eager for purpose, she takes work at the village inn. One frigid evening, she takes in the most infuriating man she’s ever met…never suspecting for a moment that he could be the one her soul hungers for. The narrator Lily Collingwood did a wonderful job, and was very easy to listen too. She did a great job with the different characters and their voices. If you are looking for a great romance, then you need to read/listen to this book. I can’t wait to read the next book by this author. Once I started listening to this book, I didn’t want to stop until the end. This Novel will make you Happy..It's Great! 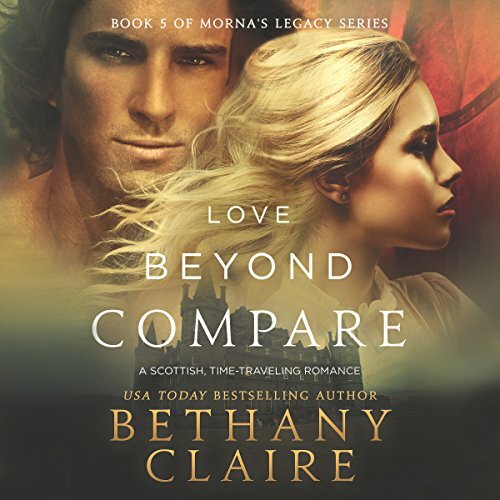 Love Beyond Compare is Book 5 in the wonderful Scottish time travel romance series "Morna's Legacy", set mainly in the 17th century Scottish Highlands. The Heroine, Jane Mitchell, is Cooper's aunt and Grace Mitchells' sister. She did not come to the past willingly but got caught up in the witch Morna's machinations (in book 4). But now that she's here, she's not leaving her family. But there's one little problem. She's BORED! Castle life is not for her. She's used to working, so she gets a job in the village at the local inn as a cook. There's only one little problem with this...Jane can't cook! Total hilarity ensues. Enter our Hero Adwen MacChristy. A rake, a wanderer and a rogue, it's time for him to settle down and take up his responsibilities as Laird of Cagair Castle, even though the mantle of responsiblity weighs heavy on him. He was supposed to meet Jane at a special dinner but she was a " no show". Instead, she is working at the inn, and he meets her at the inn, while she is not at her best. Nevertheless, he is enchanted. This book is a romance in a different vein than the previous 4 books. The H/h develop their relationship without having to a) solve a murder, b) fight an evil witch, or...well you get the idea. They deal with with emotional problems and situations unique to forging a real relationship with a strong 21st century American woman and a strong 17th century Scottish male. The romance is strong and the humor is terrific! Lily Collingwoods' narration is the icing on the cake to bring these characters to life. She is absolutely terrific. Have fun listening to this book, I know I did! * I received a copy of this audiobook from the publisher in exchange for my fair and honest review. Love Beyond Compare leaves off where In Due Time ends. After being transported into by the past by Morna, Jane Mitchell has decided to stay since everyone that she cares about is staying in the 17th century. Jane does have some resentment of not having the choice of going to the past and have dubbed Morna as a meddling witch. After spending much time at the McMillian Castle, Jane needed a purpose or something to fulfill her time. She went to work at a village inn hoping that she can find contentment. Adwen MacChristy showed up at the inn where Jane works. Thinking that Jane would fall to his charm, he would be able to bed her and win a bet with his younger brother Griffith. But Jane isn't ajust any woman. She rejected his advances. Adwen was losing a bet to remain free of taking up his responsibilities as laird of Cagair Castle. Jane wasn't going to risk her heart to Adwen. As far as she was concern, Adwen was a manwhore and who doesn't want to commit to a relationship. Adwen was going to prove Jane wrong and started to woo her. Jane does really make Adwen works for her heart. Adwen also has to discover for himself if the pain of lose was worth loving Jane instead of pushing her away when things got tough. In both characters, Jane and Adwen has to discover if love is worth the risk of going through each of their own pains to find love and happiness. I also love that Jane admitted of her having a moment of temporary insanity when she ended up in the 17th century and that she is not a shallow character. On the surface, she appears to be but she has more strength to figure herself out and of course, needed an extra push of where her heart is. Adwen has much more work of finding himself. Readers/Listeners would be wondering about Adwen's flaw. He couldn't be that perfect without a weakness in his character. Adwen may not show that he is keeping everyone at arms length in his actions but in his heart, he does that. I love that his best friend, Orick summarized everything about Adwen's character to Jane in a nutshell. The narrator Lily Collingwood does a wonderful job of narrating the story. I love her voice for each of the characters in the story. Hopefully, the narrator will come back for the next book. I was given this audiobook by the author in exchange of an honest review. I was not compensated or influence in any way in writing this review. Jane's story is everything that you come to expect from the series. It delivers with characters and storyline and depth. My new favorite author ! Can’t wait to see what the future brings! Especially for Jane. I could totally see possibilities !